With the growing popularity of community-based races and charity half marathons, more and more people are taking up running for fun. While running is associated with a lot of health and general wellness benefits, some athletes experience overuse injuries while running and training. One of these is exercise-related leg pain (ERLP), otherwise known as shin splints, with pain between the knee and ankle during or after exercise. M Reinking, T Austin, and A Hayes (2013) looked into the prevalence of ERLP in adult runners and how the pain affected their running and daily activities. They also analyzed risk factors to determine who is most likely to have leg pain from running. Out of over 200 runners, more than 50% of the runners reported at least one episode in the past year. Of this group, about 40% said that the leg pain interfered with running. They found that the most significant risk factor was previous leg injury or pain and participants who had less than three years experience running were at greater risk than more experienced runners. Those who ran less than 15 miles per week were more likely to suffer leg pain than those running more. The greatest occurrence was among amateur runners who raced at a pace of 9 minutes per mile or greater. A trigger point is a hypersensitive, nodal point of muscle that can refer pain in specific patterns (Travell and Simon's Myofascial Pain and Dysfunction Vols 1 & 2) depending on if they are active or latent. Trigger points can build up due to an acute overload/injury, or chroinic overload such as repetative strain injuries. This can be caused by a change in technique, increased training, or faulty mechanics in a joint or muscle (scar tissue etc). 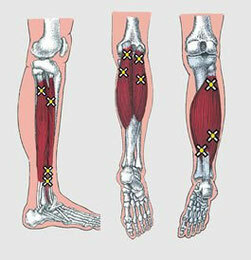 Trigger points weaken and shorten the muscle, effecting both strength and endurance. This in turn leads to further dysfunction in the surrounding tissues and joints as they compensate and are over loaded. Further trigger points then form in a snowball effect. ‘Snapping hip’ or coxa saltans/iliopsoas tendinitis/dancer's hip describes an audible snapping or popping noise as the hip moves from flexion (knee toward waist) to extension (knee down and hip joint straightened). After extended exercise pain or discomfort may be present caused by inflammation of the iliopsoas bursae. Pain often decreases with rest and diminished activity. 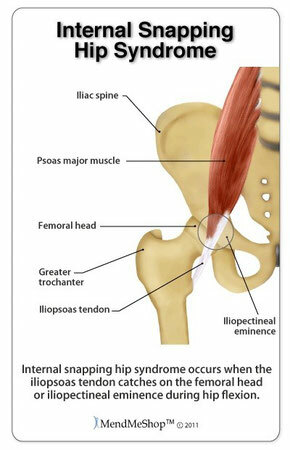 The more common lateral extra-articular type of snapping hip syndrome occurs when the iliotibial band, tensor fascia lata, or gluteus medius tendon slides back and forth across the greater trochanter. Less commonly seen medial extra-articular type is caused by the iliopsoas tendon catching on the anterior inferior iliac spine(AIIS), the lesser trochanter, or the iliopectineal ridge during hip extension, as the tendon moves from an anterior lateral (front, side) to a posterior medial (back, middle) position. 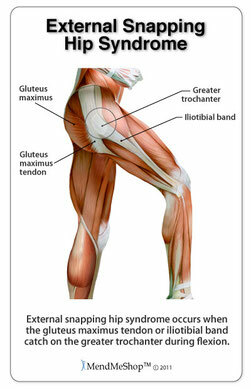 ‘Snapping Hip’ syndrome is commonly associated with a leg length difference (usually the long side is symptomatic), tightness in the iliotibial band(ITB) on the involved side, weakness in hip abductors and external rotators, poor lumbopelvic stability and abnormal foot mechanics (Overpronation). Intra-articular can also be indicative of injury such as a torn acetabular labrum, recurrent hip subluxation,ligamentum teres tears, loose bodies, articular cartilage damage, or synovial chondromatosis (cartilage formations in the synovial membrane of the joint). The more rapid the onset and the more acute the onset, the more likely it is that this could represent a stress fracture. Stress fractures are subtle fractures that occur in the bone as a result of putting too much constant stress on the bone, to the point where the bone starts to break — initially at a microscopic level. Stress fractures are common in athletes or runners who have changed their training schedules, increased the amount of time that they are playing or running… or simply bad luck. The pain from a stress fracture will typically be present from the first step you take on the court or the road. 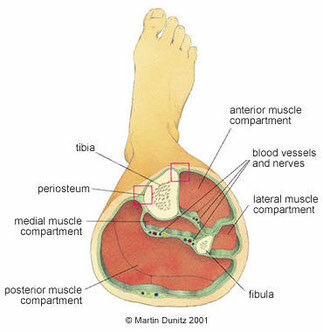 A compartment syndrome is characterised by having too much pressure in the muscle compartments in our leg. Our muscles are surrounded by very tough tissue we call fascia, it is not very flexible and some runners or athletes experience muscle swelling during activities. If this swelling is significant enough, the fascia will squeeze or put pressure on the muscle. This reduces blood flow to the muscle and the muscle will fatigue rapidly and start to hurt. People with compartment syndromes typically have no pain at the start of their run/game, but at some point during the run/game pain will start and steadily build. You will typically need to stop your activity to relieve the pain. Sometimes compartment syndrome can become so chronic and severe that it requires surgery to reduce the pressure, so best to get it looked at by chiropractor as soon as possible for prevention. The pain from shin splints or medial tibial stress syndrome tends to build gradually and is a form of compartment syndrome. You can usually initiate a run, or a game and then the pain begins shortly thereafter, or possible after the game or run itself. Medial tibial stress syndrome (or ‘shin splints’) is characterised by pain along the lower part of your leg or tibia, and the pain is along the inner border of the tibia. This is a very common cause of disability in runners and they often develop after sudden changes in physical activity, such as running longer distances or on hills, or increasing the number of days you exercise each week. Flat feet (weak arches) are another factor that can contribute to increased stress on the lower leg muscles during exercising. Tendonitis (tendon inflammation), or Tendinosis (degeneration of the tendon) is a very common issue sports medicine specialists see in sports and runners. One of the most commonly affected tendons is the achilles. If the tendon, a few inches above your ankle joint is tender, but you do not feel or see any nodules you are most likely suffering from a form of tendonitis or peri-tendonitis where the tendon itself, or the tissue around it is inflamed from chronic use. 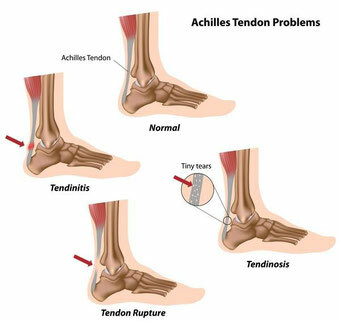 Achilles tendinosis is caused by a chronic tendonitis, causing nodules or enlargement of your tendon that is tender to touch, diagnostic ultrasound can confirm the diagnosis. Chronic achilles tendinosis causes scar tissue and weakening of the tendon, which can potentially lead to rupture. Chiropractic care has been shown to be a great option for athletes in both treating and preventing sports injuries and pain. One such study found that chiropractic treatments led to less muscle strains in the legs. Another study showed that chiropractic adjustments improved athletic performance among competitive athletes. Through soft tissue techniques and spinal manipulation, combined with advice, we can work to prevent injury occurance.